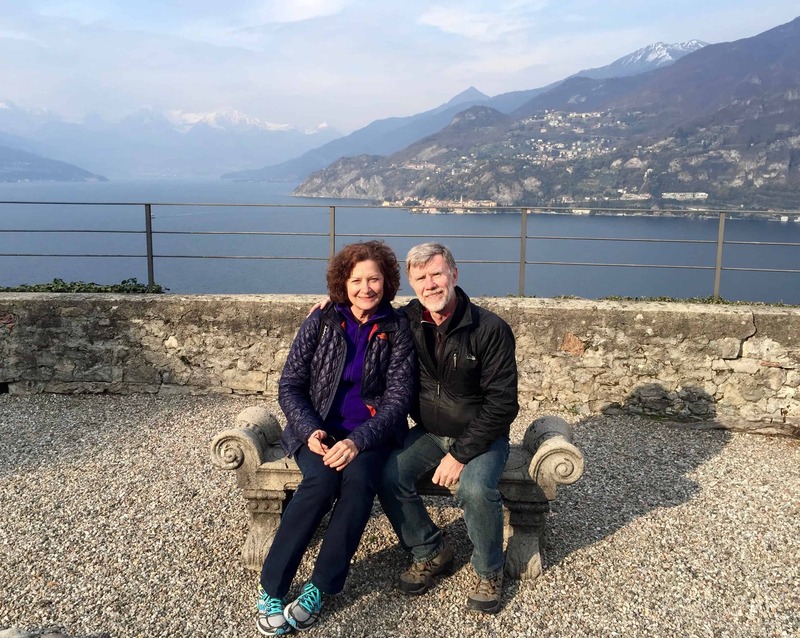 Editor’s note: We have long owed our readers the conclusion to Julie’s blog series about her Spring 2016 tour of Italian gardens! Here it is…a bit out of season, but who in the northern hemisphere doesn’t want to see sunny images of glorious gardens at this time of year? Even for non-garden lovers (are there really such people in the world? 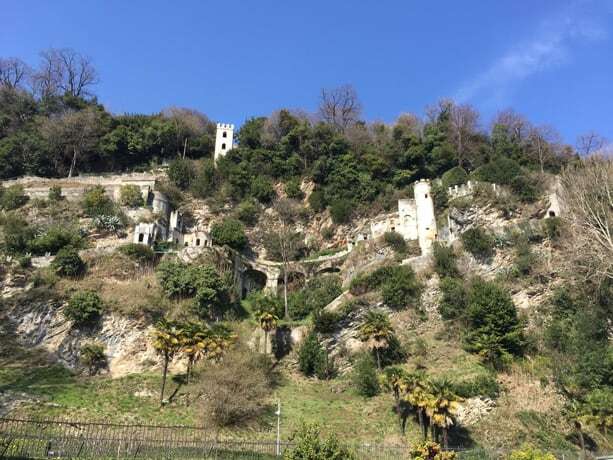 ), visiting a garden a day in Italy offers an appreciation for nature, beauty, and design, plenty of exercise, and a deep understanding of its history and culture. Here’s a short synopsis of some of the gardens we saw during our March visit. 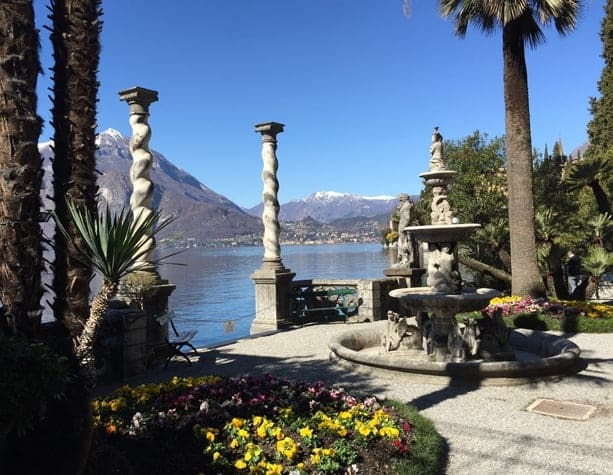 See Nine Days in Italy: Part I for photos and descriptions of one of my most cherished dream gardens at the Villa del Balbianello. 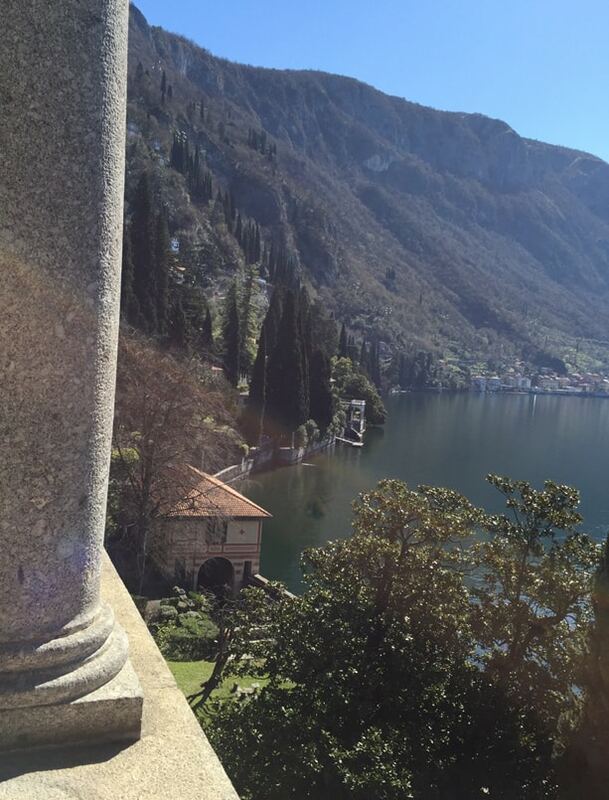 Originally a Cistercian nunnery built in the 12th century, the Villa stretches along the eastern shore of Lake Como in the charming village of Varenna. 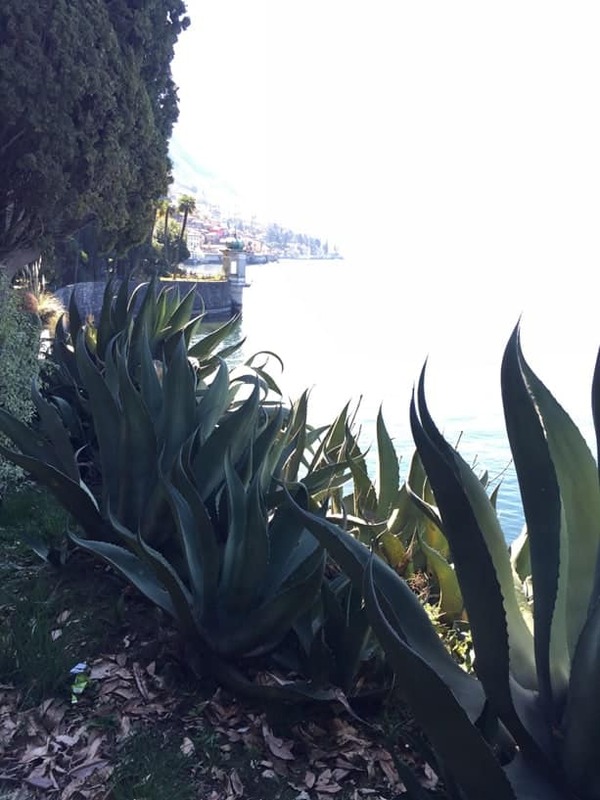 Reached by a short ferry ride from Bellagio, the terraced landscape is now a botanic garden that nicely follows my idea of the perfect stroll journey: a departure point, destination point, path, and events along the way. The view from the Villa—a departure point that shows the journey along the Lake that stretches all the way to the Turkish pavilion and beyond. 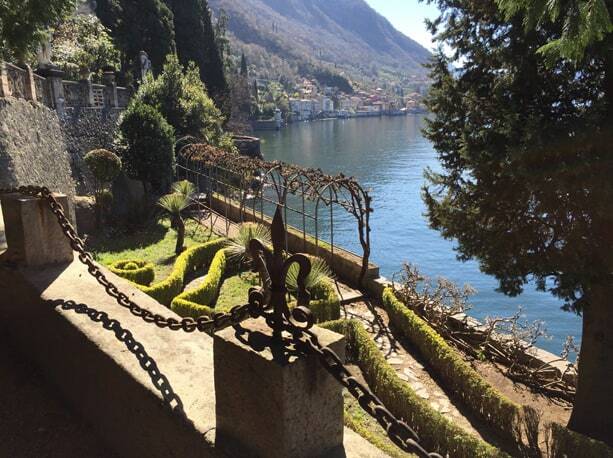 An important event along the path: a boat mooring garden along Lake Como. A journey within the journey—terraces separate the narrow lakeside paths into upper and lower gardens. An elegant event along the way to the Turkish pavilion—a blue agave with wavy fronds. 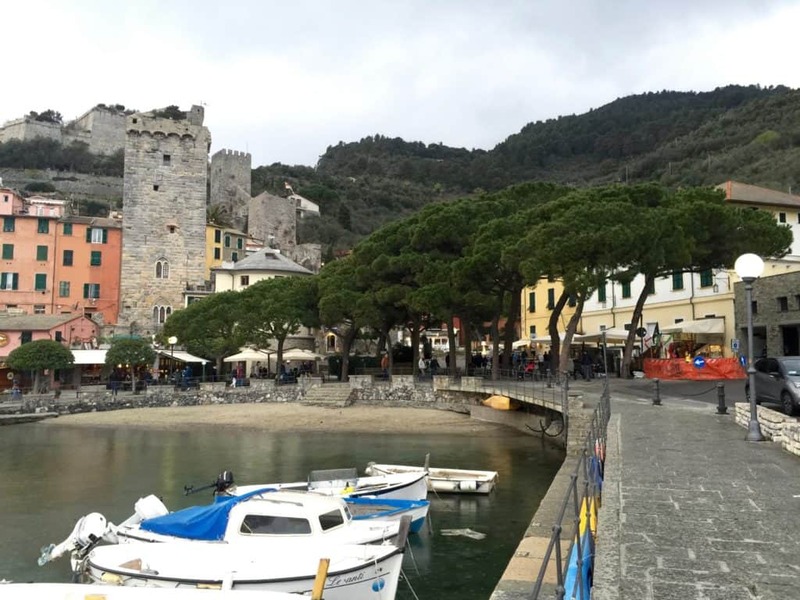 Along the Ligurian Coast, at the base of the Cinque Terre villages, lies this ancient “port of Venus” dating back to the first century BC. 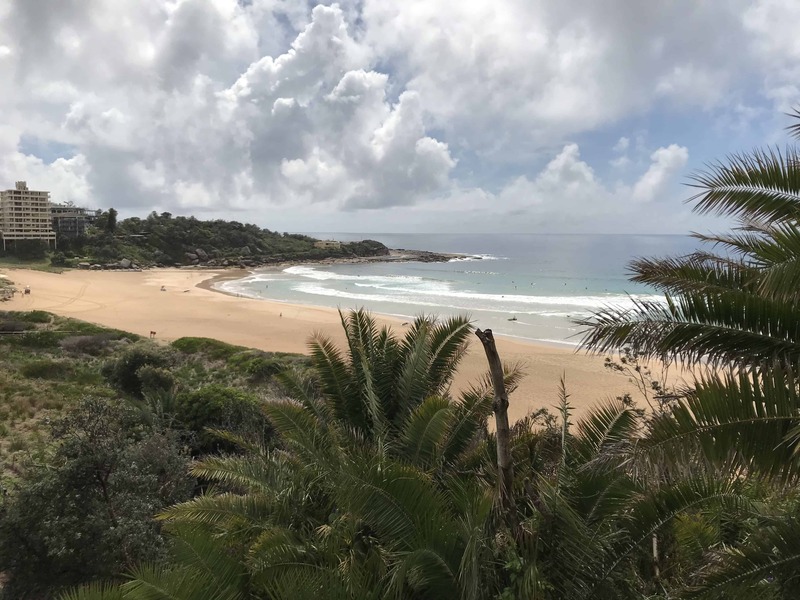 Windswept pines create the canopy for a small park above a little sandy beach. An ancient walled garden overlooks the Church of San Pietro, built in 1198. 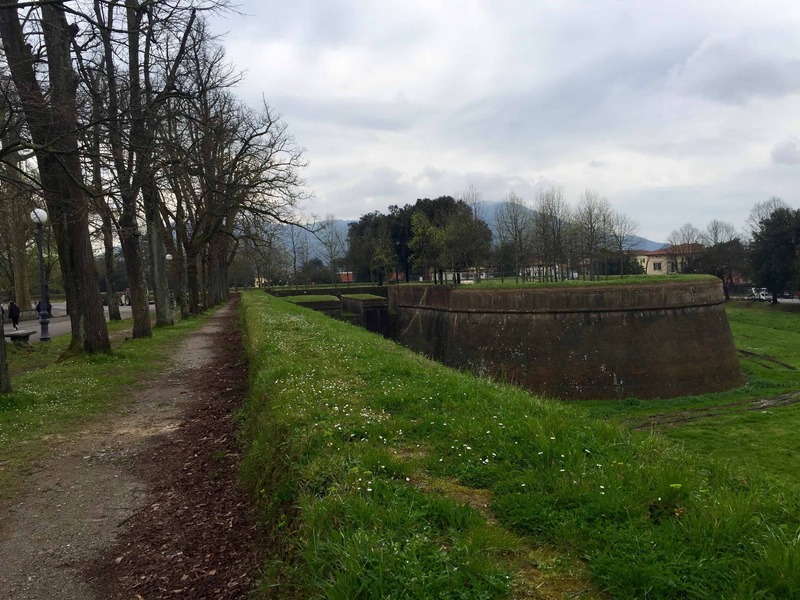 Steve and I needed a break from driving, so we decided to take a walk around (and above) the old city of Lucca on a kind of ancient version of the High Line. An earthen rampart built during the Renaissance, the space was turned into a 2.5-mile park from which you can peek down into gardens, churches, squares, and beyond across a wide-open field that separates the new city from the old. 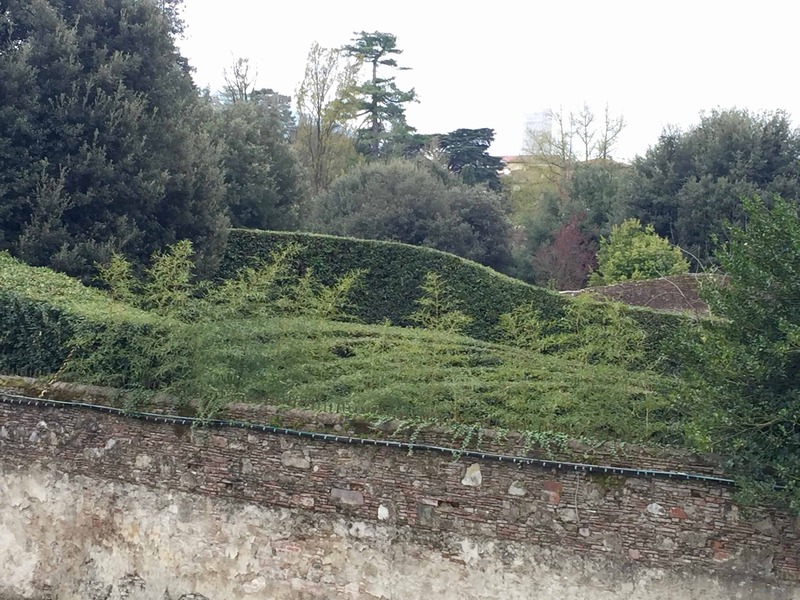 Lucca’s ramparts, built in the 16th century, surround the old city and now serve as an aerial park. 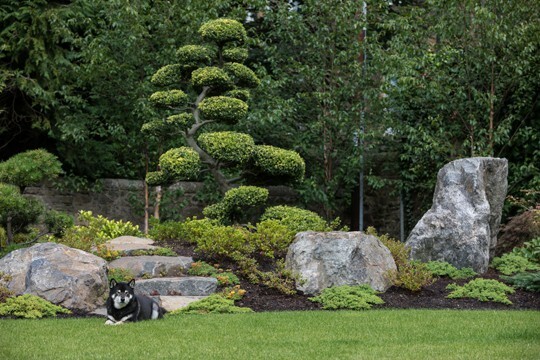 From on high you can peek into this fascinating hedged garden. 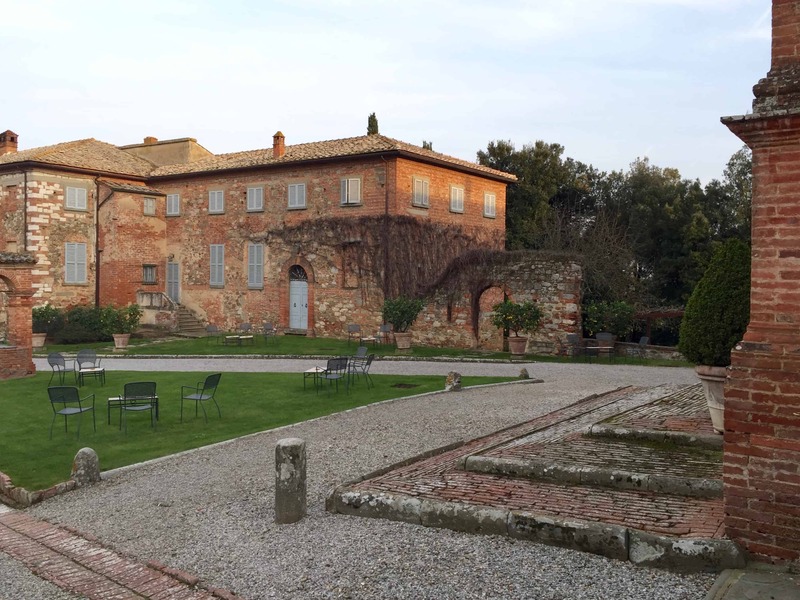 Originally a hamlet set in fields of wheat and vineyards, Amoroso is now an exquisite Tuscan inn, not far from Sienna. Stay for two or three nights if you can—each suite is different and the food is superb. Inside the inn’s walls at the Locanda dell’Amoroso. 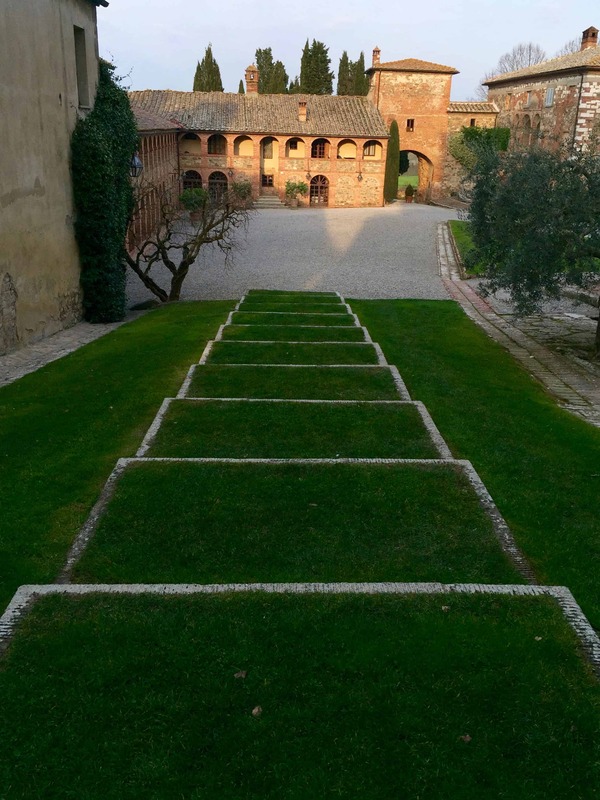 Grass steps leads into the courtyard. 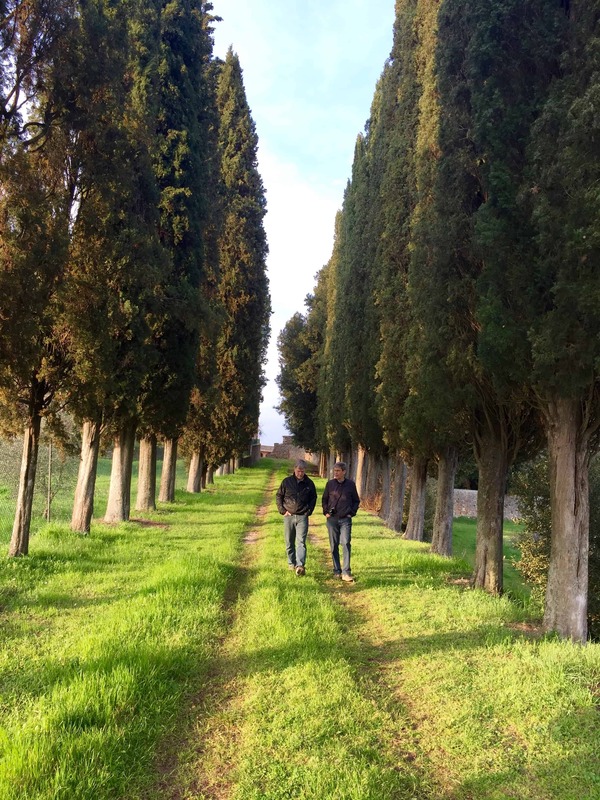 Steve and our friend Rick amble amongst the cypresses. After visiting an ancient Roman bath and touring the beautiful countryside, we and our friends stopped at the biodynamic Avignonesi Vineyards, where we had an amazing wine tour and tasting. The only woman owner of a vineyard in Italy, Virginie Saverys encourages an all-natural approach. Careful attention to biodynamic practices extend from vineyard design (using not the traditional rows, but circles and star patterns) to the smallest details (using cover crops and herb sprays and horn manure created by burying the dung of biodynamic cows in cow horns for six months!). “Healthier wines for healthier people, but also a healthier land and a healthier environment to pass on to future generations” (from website). Planting vines so that they have a better biodynamic relationship to the earth and to each other—this field shows a star pattern. 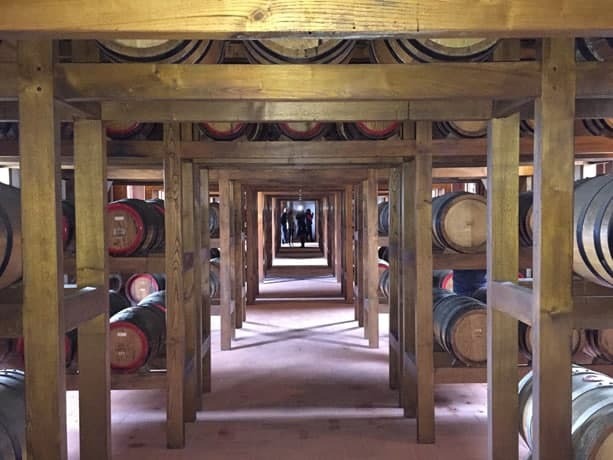 Avignonesi’s specialty: Vin Santo that is aged for ten years in caratelli—Slavonian oak casks—along with the madre, Avigonesi’s own mother yeast that is said to be over a century old. 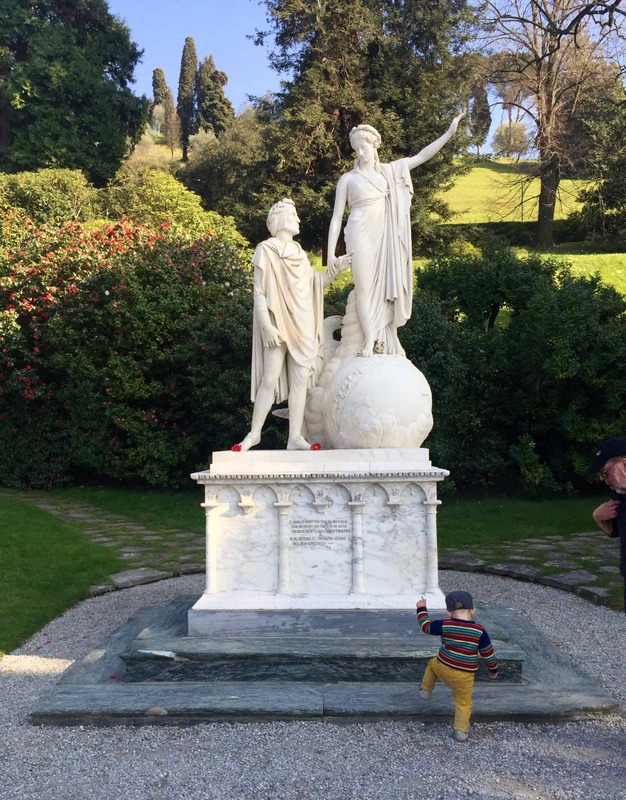 See Nine Days in Italy: Part II for my photos of the remarkable Park of the Monsters. Thanks to a very special garden project in Edinburgh, Scotland, I was fortunate to learn first-hand about the European nursery trade by visiting one of the largest wholesale plant nurseries in the world: Vannucci Piante. 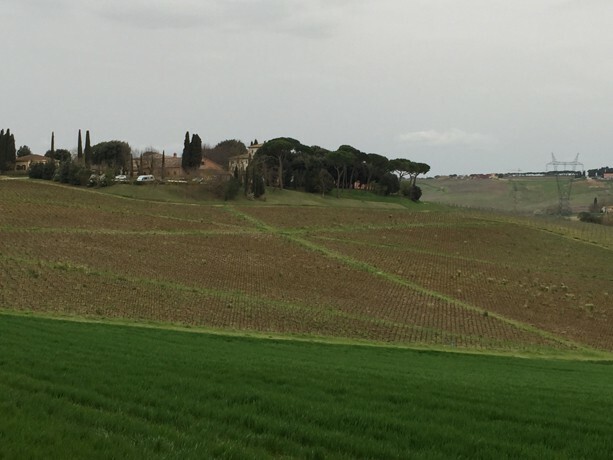 There, Giacomo Capecchi drove us from one small field to the next to view and select from their massive collection of cloud-pruned pines, yews, ilex, and camellias. 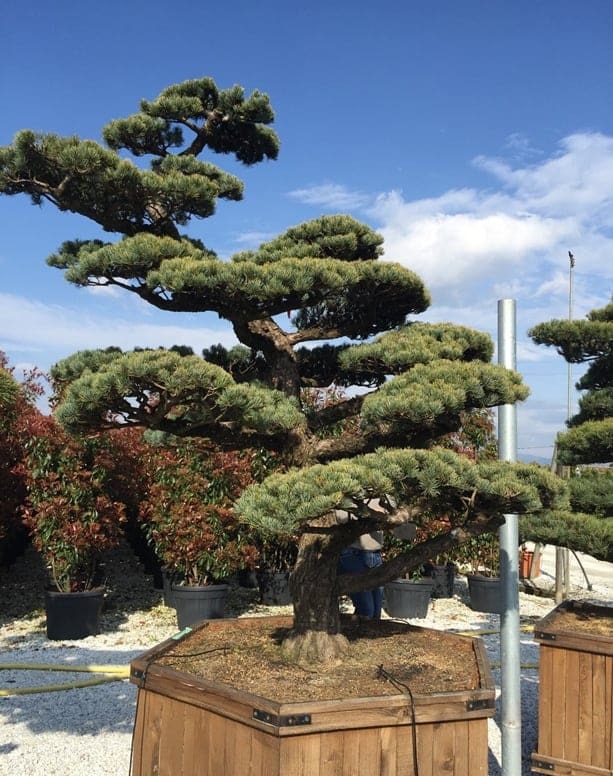 One of my favorite cloud-pruned pines—Pinus pentaphylla. Steve and I loved Bellagio so much that we decided to spend the Easter weekend there, before our departure the next morning. On the way, we stopped at another bucket-list garden of mine: the Villa d’Este garden in Cernobbio, near the city of Como. While I had always wanted to see the famous water stairs, what surprised me most was the rabbit warren of paths and towers that rose above this elegant world-renowned hotel. 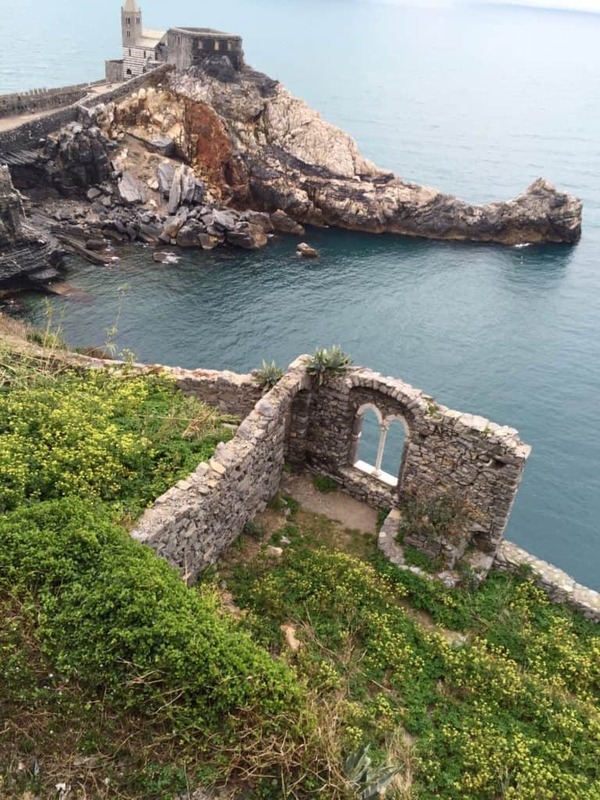 We loved the combination of exploration, exercise, and fabulous views of this hanging garden on the cliffs over the hotel grounds. 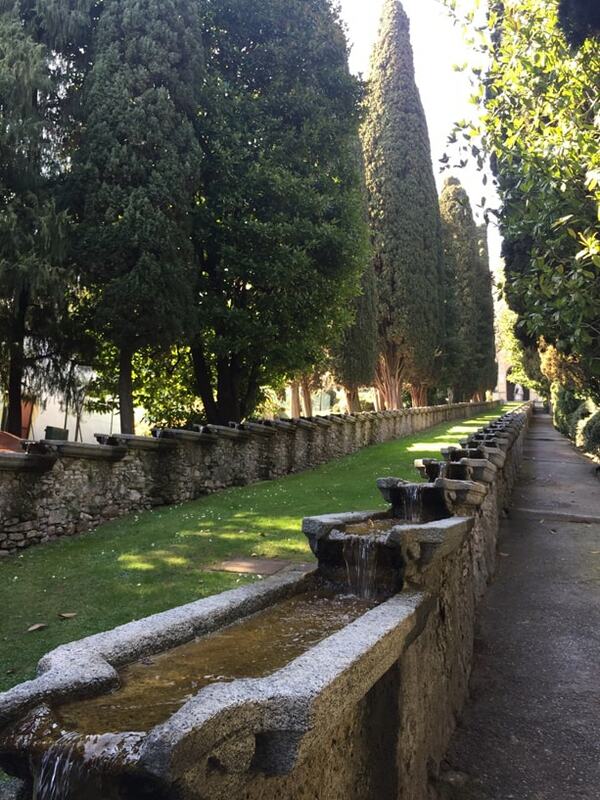 The famous water steps at the Villa d’Este lead up a long slope to a chapel, punctuated by the rhythmic placement of cypress trees along the way. This home of the Rockefeller Foundation Bellagio Center “brings together people of diverse expertise and backgrounds in a thought-provoking, collaborative environment to generate knowledge and innovative solutions addressing a wide range of global issues.” Over 50 acres of very hilly terrain, remarkable views, and winding trails sit above the town of Bellagio. 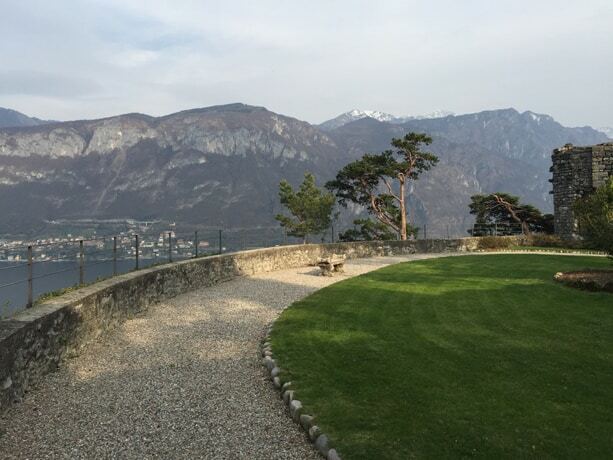 The fort at the top of the Villa Serbelloni overlooks the three arms of Lake Como—the perfect place to observe an attack or to contemplate a place of exquisite beauty (or both). 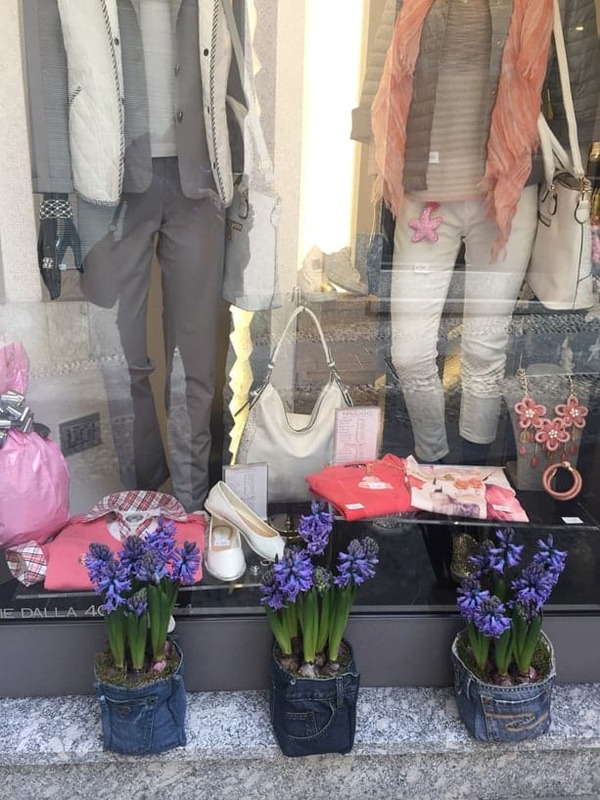 No matter where you look in Bellagio, there’s always another garden! A happy couple. In the distance are the snow-capped peaks of the Swiss Alps. This elegant villa was built in the 1800’s by Francesco Melzi d’Eril, count of Lodi and Vice president of the First Italian Republic in the time of Napoleon. Its buildings and grounds were influenced by the neoclassical style prevalent in Napoleanic France. 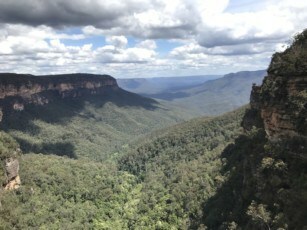 Huge swaths of azaleas and rhododendrons drape the steep hillsides, where statues and small buildings lure visitors to explore. 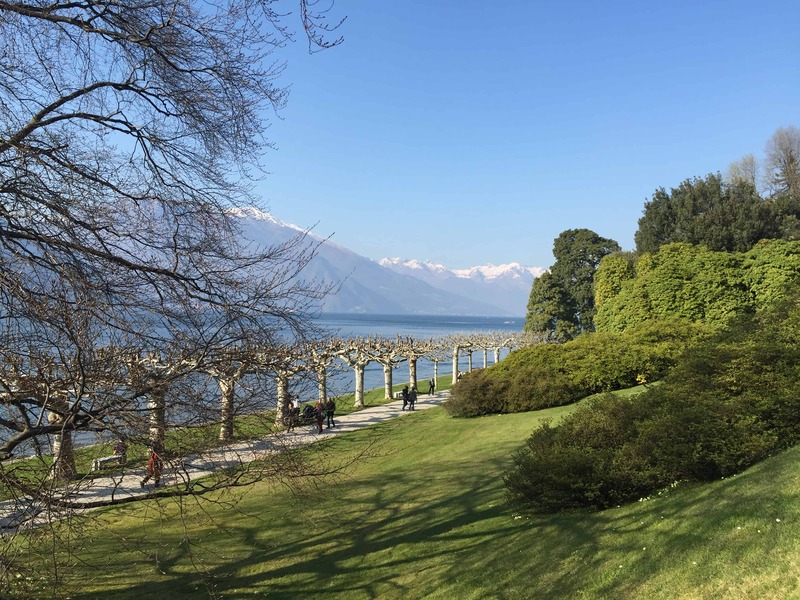 Pollarded plane trees line the walk to the Villa and frame the view to snowcapped peaks. Giovanni Battista Comolli’s elegant statue of Beatrice consoling Dante shows visitors the way to the villa. 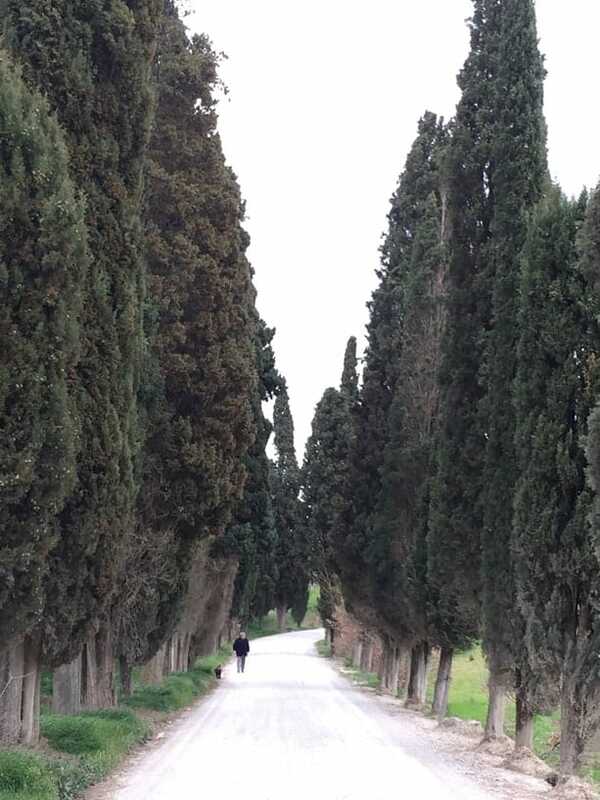 A stroller and his dog are dwarfed by an allee of cypress trees. 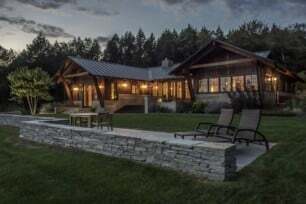 The JMMDS blog is where you’ll find our latest news, information about our projects, links to articles by and about our studio, and posts written by Julie and our staff about landscape design, with tips, videos, how-to’s, project before & after images, and more. Subscribe to receive email notifications when we post something new. 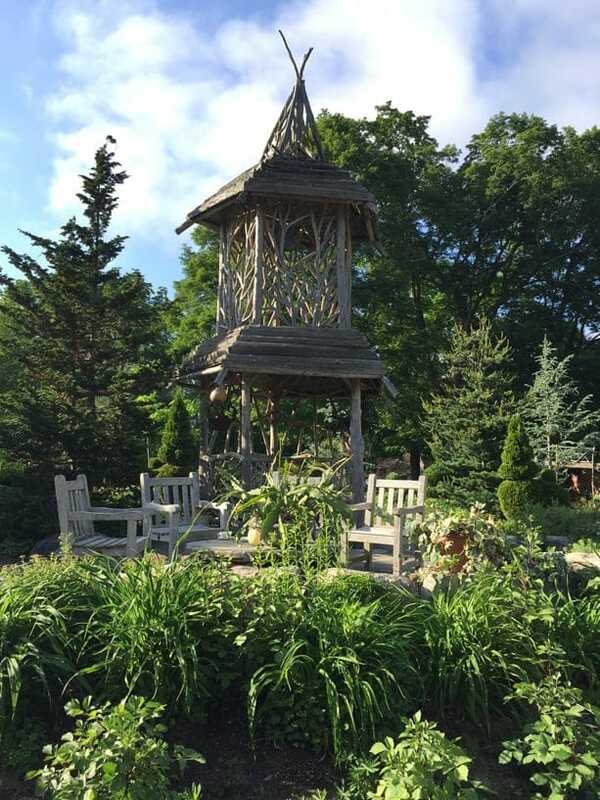 Massachusetts Horticultural Society’s Elm Bank Celebrates 20 Years!